NSI Tork® DGS Series Single channel digital timer switch is suitable for signaling and duty cycle applications. It accommodates conductor of size 18 to 12-AWG. It has a voltage rating of 120 to 277-Volts AC, current rating of 20-Amps and frequency rating of 50/60-Hz. It operates at a temperature ranging from -31 to 131 deg F. This 2-Pole digital timer switch is screw mountable. 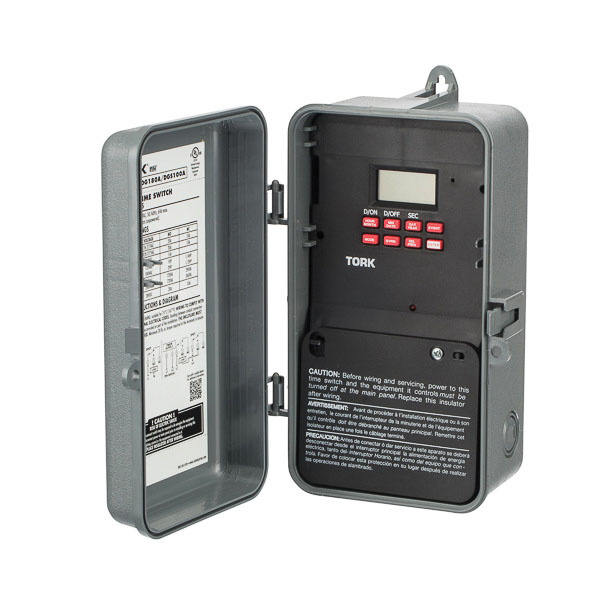 The 24-Hour timer switch with ON/OFF action, has DPDT contact configuration. It features NEMA 3R Noryl indoor/outdoor enclosure with lockable hasp. It has a contact rating of 20-Amps NO and 10-Amps NC at 24 to 277-Volts AC (resistive), 20-Amps NO and 10-Amps NC at 120 to 277-Volts AC (ballast) and 15-Amps NO at 120-Volts AC (tungsten). It has a contact rating of 720 VA NO and 290 VA NC at 120-Volts AC, 720 VA NO and 360 VA NC at 240-Volts AC (pilot duty), 1 hp NO and 1/4 hp NC at 120-Volts AC, 2 hp NO and 1/2 hp NC at 240-Volts AC (motor load), 20-Amps NO and 10-Amps NC at 28-Volts DC (resistive). The timer switch is cULus listed.